You are a frequent flier and prefer private jet charters for your corporate and personal travel needs. While you enjoy the exclusiveness of your charter and the flexibility, you might notice that some private jet companies are switching over to prepaid jet card programs. Prepaid jet card programs let you book a flight with an aircraft company based on a budget. They promise last-minute access to luxury flights based on a set charter rate. While there are advantages, there are significant disadvantages that most private jet charter operators leave out. While the glitz and glam of a prepaid jet card program may have you swooning, be sure you understand what you are signing up for, and ensure it is a sound investment for your corporate aviation needs. 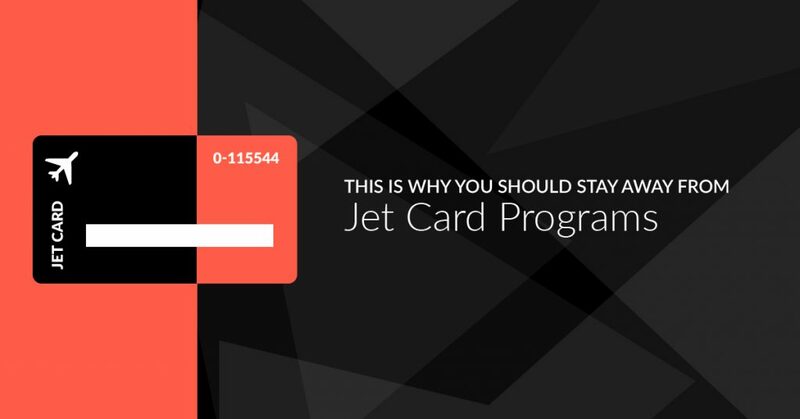 Your flight hours are prepaid with the jet card program. While this is advertised as a budget-friendly option — because you have a fixed cost — it may be difficult to pinpoint your flight hours. For example, you could have a busy year where your business aviation needs increase to 20 hours. Then, the following quarter you only required one hour. When flights through the year are unexpected and inconsistent, as it is with most businesses, it is impossible to predict how many flight hours you will need. Furthermore, you do not want to invest in a jet card program, pay a large sum upfront, and then realize you do not need 25 hours of flight time. Jet card programs will have fine print in the contract, and as a solid business professional, you most likely have read those contracts. However, what you may not realize are the additional fees that are added to your flight time. For example, there are flight hours stated in the contract. Your contract terms dictate the cost per flight hour, but there will also be dictated pricing for peak travel and holiday season trips. So, you do not have a fixed rate per flight or plane. Also, there is the issue of taxi time. A clear majority of jet card programs roll taxi time into the flight time, with as much as 15 minutes per trip both ways. Even if the correct taxi time is only five minutes, the contract may have a standard 10-minute taxi allotment. So, you’ll lose 20 minutes per flight regardless. Read your contract carefully, and you might see wording about non-preferred FBOs. If you do not use an airport operator that meets the needs of the jet card program, you pay additional fees for using fixed base operators outside of the contract relationship. You must purchase a pre-set number of hours, but then you must use those hours before they expire. Most cards will require that you use the time up within a certain timeframe. After all, the charter company does not want you to access lower flight rates years later when prices have fluctuated upward. Expiration dates will vary, but read the contract carefully, and you might see that you have only a few months or possibly one year to use those flight hours. Your corporate aviation needs might be scattered, so if you fly inconsistently or less than 10 hours per year, a prepaid jet card program will be an unnecessary expense for your business. Also, when your business does not fly regularly, you can often negotiate better rates with a private jet charter marketplace for your here-and-there needs over a prepaid card program. While prepaid jet cards have their benefits, they too have significant disadvantages. As a business owner, you must contemplate if the costs and risks of a jet card are worth the investment. One thing to consider is working with a private jet charter marketplace. Jettly offers a new way to book the private charters you need, when you need them, and with prices that suit your business aviation budgetary requirements. With Jettly, you login, select the aircraft type, enter your itinerary, and you can begin receiving quotes in minutes. You can do everything from your app, including requesting a pickup. Request a quote online by selecting your size jet and destination. Do not forget to add empty leg notifications on your app so that you can catch a last-minute flight to your next business meeting for up to 75% off. How Much Does a Private Jet Charter Flight ACTUALLY Cost?